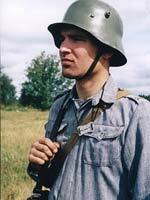 The Military-Historical Festival "Karelian Borders. Porgankondushi"
On 15 August 2004 in the ancient Lake Ladoga shore village Pogrankondushi (the Pitkäranta district) the annual military-historical festival "Karelian Borders" was held for the third time. The place of holding the festival was not chosen by chance. The name of the village "Pogrankondushi" means "Border-Kondushi"- "the village, standing on the border". During the last millenium the borderline on the territory of the northern Lake Ladoga shore was fixed and moved many times. The boundary rocks, indicating the state border, all bear witness to those events. One of them, Varashev Stone, indicating the border between Russia and Sweden (1618), is situated on the Lake Ladoga shore 2 kilometres from the village. Another stone, indicating the state border between the USSR and Finland during 1917-1940, is situated in the village of Pogrankondushi. It is still bears the inscription "USSR" from one side and "Suomi" from another. Defence structures made of concrete (built in the end of the 1930s) as well as the Memorial to the Soviet soldiers, who have been killed during the World War II-all bear witness to the heavy fights. The Memorial Action, part and parcel of all the military-historical festivals, held on the former battles' territory of Karelia , took place at the Common Grave in the village of Pogrankondushi. This Action is to the memory of those, who defended our Motherland during the war. 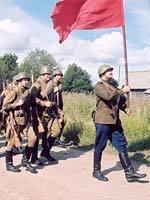 The battle of the 1944 during the Greate Patriotic War, the period of liberating Karelia from invaders, was re-enacted by the members of the Military-History Amateur clubs from Petrozavodsk and St.Petersburg. This year about 80 "soldiers" took part in the "fight". The cultural programme of the Festival was closely connected with the War theme: songs of the War-time period were accompanied by the brass band, the Museum of Regional Studies of the town of Pitkäranta offered an excursion to the sights of the military-history. Those who was lucky enough took cartridgecases as souvenirs to remember the festival. The village of Pogrankondushi is situated along a perspective international tourist route "The Blue Highway" and has a very rich military-historical heritage, connected with the relations among Russia, Sweden and Finland during different periods of time. One of the goals of the project "Border. The History of Relations among Russia, Sweden and Finland in Priladozhiye" is to manage this heritage into cultural, educational and tourist activity. The annual festival is being held within the frame of this project. The Festival was organized by: the Local Administration of the town of Pitkäranta, the State Center for Protection and Management of Historic and Cultural Monuments of the Ministry of Culture of the Republic of Karelia, the Military-History Amateurs' Club "Styag". The Festival "Karelian Borders. Pogrankondushi" completes the parade of the Military-historical Festivals "Karelian Borders", held within the frame of the Republican programme of events, devoted to the 60th anniversary of Karelia's liberation.